^ a b c d e f g h i j k l m n o p q r Holtz, Thomas R. (2004). “Tyrannosauroidea”. In Weishampel, David B.. The Dinosauria (Second ed.). Berkeley: University of California Press. pp. 111–136. ISBN 978-0-520-24209-8. ^ a b c d e f g h i j Xu Xing, X; Norell, Mark A.; Kuang Xuewen; Wang Xiaolin; Zhao Qi; & Jia Chengkai. ; Kuang, Xuewen; Wang, Xiaolin; Zhao, Qi; Jia, Chengkai (2004). “Basal tyrannosauroids from China and evidence for protofeathers in tyrannosauroids”. Nature 431 (7009): 680–684. Bibcode: 2004Natur.431..680X. doi:10.1038/nature02855. PMID 15470426. ^ a b c d e Hutt, Stephen; Naish, Darren (2001). “A preliminary account of a new tyrannosauroid theropod from the Wessex Formation (Early Cretaceous) of southern England”. Cretaceous Research 22 (2): 227–242. doi:10.1006/cres.2001.0252. ^ a b Brusatte, S.L. ; Norell, Mark A.; Carr, Thomas D.; Erickson, Gregory M.; Hutchinson, John R.; Balanoff, Amy M.; Bever, Gabe S.; Choiniere, Jonah N. et al. (2010). “Tyrannosaur paleobiology: new research on ancient exemplar organisms”. Science 329 (5998): 1481–1485. Bibcode: 2010Sci...329.1481B. doi:10.1126/science.1193304. PMID 20847260. https://www.pure.ed.ac.uk/ws/files/8236796/PDF_Brusatteetal2010TyrannosaurPaleobiology.pdf. ^ a b c d e f g h i Xu X.; Clark, J.M. ; Forster, C. A.; Norell, M.A. ; Erickson, G.M. ; Eberth, D.A. ; Jia, C.; Zhao, Q. (2006). “A basal tyrannosauroid dinosaur from the Late Jurassic of China”. Nature 439 (7077): 715–718. doi:10.1038/nature04511. PMID 16467836. http://lesdinos.free.fr/Ty160.pdf. ^ a b c d e Carr, Thomas D.; Williamson, Thomas E.; & Schwimmer, David R. (2005). “A new genus and species of tyrannosauroid from the Late Cretaceous (middle Campanian) Demopolis Formation of Alabama”. Journal of Vertebrate Paleontology 25 (1): 119–143. doi:[[doi:10.1671%2F0272-4634%282005%29025%5B0119%3AANGASO%5D2.0.CO%3B2|10.1671/0272-4634(2005)025[0119:ANGASO]2.0.CO;2]]. ^ a b c Rauhut, Oliver W.M. (2003). “A tyrannosauroid dinosaur from the Upper Jurassic of Portugal”. Palaeontology 46 (5): 903–910. doi:10.1111/1475-4983.00325. ^ Hutchinson, John R.; & Garcia, Mariano . (2002). “Tyrannosaurus was not a fast runner”. Nature 415 (6875): 1018–1021. Bibcode: 2002Natur.415.1018H. doi:10.1038/4151018a. PMID 11875567. ^ Brochu, Christopher R. (2003). “Osteology of Tyrannosaurus rex: insights from a nearly complete skeleton and high-resolution computed tomographic analysis of the skull”. Society of Vertebrate Paleontology Memoirs 7: 1–138. doi:10.2307/3889334. JSTOR 3889334. オリジナルの2007-12-12時点によるアーカイブ。. https://web.archive.org/web/20071212211311/http://www.vertpaleo.org/publications/memoirs.cfm. ^ Carpenter, Kenneth; Russell, Dale A. (1997). “Redescription of the holotype of Dryptosaurus aquilunguis (Dinosauria: Theropoda) from the Upper Cretaceous of New Jersey”. Journal of Vertebrate Paleontology 17 (3): 561–573. doi:10.1080/02724634.1997.10011003. オリジナルの2010-07-15時点によるアーカイブ。. https://web.archive.org/web/20100715095911/http://www.vertpaleo.org/publications/jvp/17-561-573.cfm. ^ a b c Holtz, Thomas R. (1994). “The phylogenetic position of the Tyrannosauridae: implications for theropod systematics”. Journal of Paleontology 68 (5): 1100–1117. doi:10.1017/S0022336000026706. http://jpaleontol.geoscienceworld.org/cgi/content/abstract/68/5/1100. ^ Osborn, Henry F. (1905). “Tyrannosaurus and other Cretaceous carnivorous dinosaurs”. Bulletin of the American Museum of Natural History 21 (3): 259–265. doi:10.1111/j.1468-5965.2007.00735_17.x. ^ a b Walker, Alick D. (1964). “Triassic reptiles from the Elgin area: Ornithosuchus and the origin of carnosaurs”. Philosophical Transactions of the Royal Society of London. Series B, Biological Sciences 248 (744): 53–134. Bibcode: 1964RSPTB.248...53W. doi:10.1098/rstb.1964.0009. ^ a b Bonaparte, José F.; Novas, Fernando E. (1990). “Carnotaurus sastrei Bonaparte, the horned, lightly built carnosaur from the Middle Cretaceous of Patagonia”. Contributions in Science (Natural History Museum of Los Angeles County 416: 1–42. ^ Sereno, Paul C. (1998). “A rationale for phylogenetic definitions, with application to the higher-level taxonomy of Dinosauria”. Neues Jahrbuch für Geologie und Paläontologie, Abhandlungen 210 (1): 41–83. doi:10.1127/njgpa/210/1998/41. ^ F. E. Novas; F. L. Agnolín; M. D. Ezcurra; J. I. Canale; J. D. Porfiri (2012). “Megaraptorans as members of an unexpected evolutionary radiation of tyrant-reptiles in Gondwana”. Ameghiniana 49 (Suppl): R33. http://www.ameghiniana.org.ar/index.php/ameghiniana/article/view/868/1618. ^ Porfiri, J. D., Novas, F. E., Calvo, J. O., Agnolín, F. L., Ezcurra, M. D. & Cerda, I. A.; Novas; Calvo; Agnolín; Ezcurra; Cerda (2014). “Juvenile specimen of Megaraptor (Dinosauria, Theropoda) sheds light about tyrannosauroid radiation”. Cretaceous Research 51: 35–55. doi:10.1016/j.cretres.2014.04.007. ^ Yun, C (2015). “Comments on the juvenile Megaraptor specimen and systematic positions of megaraptoran theropods”. PeerJ PrePrints 3: e1051. doi:10.7287/peerj.preprints.851v1. ^ Bell, P. R., Cau, A., Fanti, F., & Smith, E., in press. A large-clawed theropod (Dinosauria: Tetanurae) from the Lower Cretaceous of Australia and the Gondwanan origin of megaraptorid theropods. Gondwana Research. ^ Novas, F.E. ; Rolando, A.M.A. ; Angolan, F.L. (2016). “Phylogenetic relationships of the Cretaceous Gondwanan theropods Megaraptor and Australovenator: the evidence afforded by their manual anatomy”. Memoirs of Museum Victoria 74: 49–61. doi:10.24199/j.mmv.2016.74.05. オリジナルの2016-08-18時点によるアーカイブ。. https://web.archive.org/web/20160818172356/https://museumvictoria.com.au/pages/381424/049-061_MMV74_Novas_4_WEB.pdf. ^ Romer, Alfred S. (1956). Osteology of the Reptiles. Chicago: University of Chicago Press. p. 772pp. ISBN 978-0-89464-985-1. ^ Gauthier, Jacques (1986). “Saurischian monophyly and the origin of birds”. In Padian, Kevin. The Origin of Birds and the Evolution of Flight. Memoirs of the California Academy of Sciences 8. San Francisco, CA: Published by California Academy of Sciences. pp. 1–55. ISBN 978-0-940228-14-6. ^ Molnar, Ralph E.; Kurzanov, Sergei M. (1990). “Carnosauria”. In Weishampel, David B.. The Dinosauria (First ed.). Berkeley: University of California Press. pp. 169–209. ISBN 978-0-520-06727-1. ^ Matthew, William D.; Brown, Barnum (1922). “The family Deinodontidae, with notice of a new genus from the Cretaceous of Alberta”. Bulletin of the American Museum of Natural History 46: 367–385. ^ von Huene, Friedrich (1923). “Carnivorous Saurischia in Europe since the Triassic”. Geological Society of America Bulletin 34 (3): 449–458. Bibcode: 1923GSAB...34..449V. doi:10.1130/GSAB-34-449. ^ Novas, Fernando E. (1992). “The evolution of the carnivorous dinosaurs”. In Sanz, José L. (Spanish). Los Dinosaurios y su Entorno Biotico: Actas del Segundo Curso de Paleontología en Cuenca. Cuenca: Instituto "Juan de Valdez". pp. 125–163. ^ a b Senter, Phil (2007). “A new look at the phylogeny of Coelurosauria (Dinosauria, Theropoda)”. Journal of Systematic Palaeontology 5 (4): 429–463. doi:10.1017/S1477201907002143. ^ Sereno, Paul C. (1999). “The evolution of dinosaurs”. Science 284 (5423): 2137–2147. doi:10.1126/science.284.5423.2137. PMID 10381873. ^ a b c Rauhut, Oliver W.M. (2003). The interrelationships and evolution of basal theropod dinosaurs. 69. 1–213. ISBN 978-0-901702-79-1. ^ Currie, Philip J.; Hurum, Jørn H; & Sabath, Karol. (2003). “Skull structure and evolution in tyrannosaurid phylogeny”. Acta Palaeontologica Polonica 48 (2): 227–234. http://app.pan.pl/archive/published/app48/app48-227.pdf. ^ a b Norell, Mark A.; Barsbold, Rinchen (2006). “A new dromaeosaurid theropod from Ukhaa Tolgod (Ömnögov, Mongolia)”. American Museum Novitates 3545: 1–51. doi:[[doi:10.1206%2F0003-0082%282006%293545%5B1%3AANDTFU%5D2.0.CO%3B2|10.1206/0003-0082(2006)3545[1:ANDTFU]2.0.CO;2]]. http://digitallibrary.amnh.org/bitstream/2246/5823/1//v3/dspace/updateIngest/pdfs/N3545.pdf. ^ Rauhut, Oliver W. M.; Milner, Angela C.; Moore-Fay, Scott (2010). “Cranial osteology and phylogenetic position of the theropod dinosaur Proceratosaurus bradleyi (Woodward, 1910) from the Middle Jurassic of England”. Zoological Journal of the Linnean Society 158: 155–195. doi:10.1111/j.1096-3642.2009.00591.x. ^ Buffetaut, Eric; Suteethorn, Varavudh; & Tong Haiyan; Tong, Haiyan (1996). “The earliest known tyrannosaur from the Lower Cretaceous of Thailand”. Nature 381 (6584): 689–691. Bibcode: 1996Natur.381..689B. doi:10.1038/381689a0. ^ a b Holtz, Thomas R.; Molnar, Ralph E. (2004). “Basal Tetanurae”. In Weishampel, David B.. The Dinosauria (Second ed.). Berkeley: University of California Press. pp. 71–110. ISBN 978-0-520-24209-8. ^ Loewen, M.A. ; Irmis, R.B. ; Sertich, J.J.W. ; Currie, P. J.; Sampson, S. D. (2013). Evans, David C. ed. “Tyrant Dinosaur Evolution Tracks the Rise and Fall of Late Cretaceous Oceans”. PLoS ONE 8 (11): e79420. Bibcode: 2013PLoSO...879420L. doi:10.1371/journal.pone.0079420. PMC: 3819173. PMID 24223179. https://www.ncbi.nlm.nih.gov/pmc/articles/PMC3819173/. ^ a b Kirkland, James I.; Carpenter, Kenneth (1997). “Lower to Middle Cretaceous Dinosaur faunas of the central Colorado Plateau: a key to understanding 35 million years of tectonics, sedimentology, evolution, and biogeography”. Brigham Young University Geology Studies 42 (II): 69–103. ^ Manabe, Makoto (1999). “The early evolution of the Tyrannosauridae in Asia”. Journal of Paleontology 73 (6): 1176–1178. doi:10.1017/S002233600003105X. 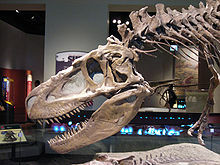 http://jpaleontol.geoscienceworld.org/cgi/content/abstract/73/6/1176. ^ Chase Doran Brownstein (2018). A tyrannosauroid from the lower Cenomanian of New Jersey and its evolutionary and biogeographic implications. Bulletin of the Peabody Museum of Natural History 59 (1): 95–105. doi:10.3374/014.058.0210. ^ Nesov, Lev A. (1995) (Russian). Dinosaurs of Northern Eurasia: new data about assemblages, ecology and paleobiogeography. St. Petersburg: Scientific Research Institute of the Earth's Crust, St. Petersburg State University. p. 156pp. ^ Bell, Phil R.; Cau, Andrea; Fanti, Federico; Smith, Elizabeth (2015). "A large-clawed theropod (Dinosauria: Tetanurae) from the Lower Cretaceous of Australia and the Gondwanan origin of megaraptorid theropods". Gondwana Research. doi:10.1016/j.gr.2015.08.004. ^ Mcdonald, Wolfe; Kirkland (2010). “A new basal hadrosauroid (Dinosauria: Ornithopoda) from the Turonian of New Mexico”. Journal of Vertebrate Paleontology 30 (3): 799–812. doi:10.1080/02724631003763516. ^ Fiorillo, Anthony R.; & Gangloff, Roland A. (2000). “Theropod teeth from the Prince Creek Formation (Cretaceous) of northern Alaska, with speculations on Arctic dinosaur paleoecology”. Journal of Vertebrate Paleontology 20 (4): 675–682. doi:[[doi:10.1671%2F0272-4634%282000%29020%5B0675%3ATTFTPC%5D2.0.CO%3B2|10.1671/0272-4634(2000)020[0675:TTFTPC]2.0.CO;2]]. ^ Benson, R. B. J.; Barrett, P. M.; Rich, T. H.; Vickers-Rich, P. (2010). “A southern tyrant reptile”. Science 327 (5973): 1613. Bibcode: 2010Sci...327.1613B. doi:10.1126/science.1187456. PMID 20339066. http://eprints.esc.cam.ac.uk/1361/1/Benson_et_al_2010_australiantyranno.pdf. ^ a b Zhou Zhonghe, Z; Barrett, Paul M.; & Hilton, Jason. ; Hilton, Jason (2003). “An exceptionally preserved Lower Cretaceous ecosystem”. Nature 421 (6925): 807–814. Bibcode: 2003Natur.421..807Z. doi:10.1038/nature01420. PMID 12594504. ^ Lingham-Soliar, Theagarten; Feduccia, Alan (2007). “A new Chinese specimen indicates that 'protofeathers' in the Early Cretaceous theropod dinosaur Sinosauropteryx are degraded collagen fibres”. Proceedings of the Royal Society of London. Series B, Biological Sciences 274 (1620): 1823–1829. doi:10.1098/rspb.2007.0352. PMC: 2270928. PMID 17521978. https://www.ncbi.nlm.nih.gov/pmc/articles/PMC2270928/. ^ a b Chen Peiji, Pei-ji; Dong Zhiming; Zhen, Shuo-Nan (1998). “An exceptionally well-preserved theropod dinosaur from the Yixian Formation of China”. Nature 391 (6663): 147–152. Bibcode: 1998Natur.391..147C. doi:10.1038/34356. ^ Xu Xing, X; Zhou Zhonghe & Prum, Richard A. (2003). “Branched integumental structures in Sinornithosaurus and the origin of feathers”. Nature 410 (6825): 200–204. doi:10.1038/35065589. PMID 11242078. ^ Xu, X.; Wang, K.; Zhang, K.; Ma, Q.; Xing, L.; Sullivan, C.; Hu, D.; Cheng, S. et al. (2012). “A gigantic feathered dinosaur from the Lower Cretaceous of China”. Nature 484 (7392): 92–95. Bibcode: 2012Natur.484...92X. doi:10.1038/nature10906. PMID 22481363. オリジナルの2012-04-17時点によるアーカイブ。. https://web.archive.org/web/20120417134949/http://www.xinglida.net/pdf/Xu_et_al_2012_Yutyrannus.pdf. ^ Martin, Larry D.; & Czerkas, Stephan A. (2000). “The fossil record of feather evolution in the Mesozoic”. American Zoologist 40 (4): 687–694. doi:[[doi:10.1668%2F0003-1569%282000%29040%5B0687%3ATFROFE%5D2.0.CO%3B2|10.1668/0003-1569(2000)040[0687:TFROFE]2.0.CO;2]]. ^ Tanke, D.H. and Brett-Surman, M.K. 2001. Evidence of Hatchling and Nestling-Size Hadrosaurs (Reptilia:Ornithischia) from Dinosaur Provincial Park (Dinosaur Park Formation: Campanian), Alberta, Canada. pp. 206-218. In: Mesozoic Vertebrate Life—New Research Inspired by the Paleontology of Philip J. Currie. Edited by D.H. Tanke and K. Carpenter. Indiana University Press: Bloomington. xviii + 577 pp.